In 1988, Eddie “The Eagle” Edwards attended the Winter Olympics as the sole representative of the Great Britain ski jumping team. Facing active discouragement from his nation’s Olympic committee, Edwards was forced to self-fund the journey that led him to the Calgary-held Olympics, mounting his campaign on sheer determination and grit rather than skill or, you know, practice. His name became synonymous with perseverance, his bumbling visage a representation of that sportsman mantra of being the best that you can be. Every since he was a wee boy, we’re told, Eddie has aspired to become an Olympian. He clocks himself in the bath tub, pinching his nose and holding his breathe just beneath the surface of the water. He can’t quite breach a minute. Not one to let something like talent stand in his way, he packs up his suitcase and struts across town to hitch a ride to the Olympics, where he’s decided he’ll compete in the (nonexistent) Breath Holding Competition. This fantastical, definitively childlike approach to life goes on to define the man Eddie will become. Much to his mother and father’s chagrin (Jo Hartley and Keith Allen respectively), his far-fetched Olympic dreams become Eddie’s ineludible fate and he transitions from youth to teenagedom to adulthood with his stubborn fixation on making it to the Olympics remaining unbent and unbroken. Dexter Fletcher‘s film, which fancies itself a somewhat accurate portrayal of the eccentric sporting figure, uses a moderately trite inspirational backbone to bring relative clairvoyance to Eddie’s peculiar quest. Using the visual and aural framework of the 1980s (with a transportative collection of upbeat, synch-heavy late-80s jams), the underdog story keeps true to Eddie’s unorthodox ascent to being a certifiable Olympian, though muddles some details along the way, prettying it up to make the film more family-friendly and easily digestible. Where Eddie the Eagle bucks from tradition is in the particular moments that comprise the familiar makeup. There’s a bumbling, almost autistic quality to Eddie – he’s the unlikely pairing of Napoleon Dynamite and Evel Knievel – that defies the conventional hero archetype. Even for an underdog story of this nature. He’s ten thousand leagues from charming and not necessarily easy on the eyes but his sheer determination in the face of abject failure is what earned him the title of “heroic failure”. The duality of his champion’s adamance and relative lack of talent make for a stubborn if winning characterization. Giving life to the challenging persona, Taron Egerton does flirt with the line of caricature at given moments. Performing Eddie, the young Brit who caught the attention of the world playing Eggsy in Matthew Vaughn’s Kingsman: The Secret Service (Vaughn also served as a producer here) screws up his face into an orchid of confusion and steadfast fortitude. Dejected from the start, Eddie’s Olympic aspirations are fool hearty in the context of a childhood medical condition that left him hospitalized and in a leg brace for an extended period of time – “You’ll never be an athlete,” he’s told over and over again – but there’s nothing like being told no one too many times that prompts one to fend onward irregardless. Egerton is admittedly tasked with a challenging job – that of making Eddie both a sympathetic and social inept figure – and behind heaving bifocals, gets the balancing act mostly right, though there are little moments where his screwball facial expressions threaten to tip the performance into something befitting SNL-level mockery. Eddie’s subsequent heroes journey is boldly commonplace, complete with 80s music montages, but – returning to my earlier sentiment – the small stuff in between the cliches can be extraordinary. 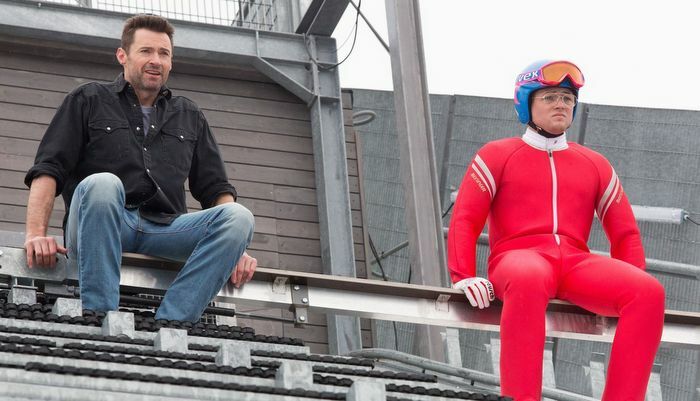 Take for instance a scene in which washed-up ski jumper Bronson Peary (Hugh Jackman rocking yet another epically dated doo), drunk on whiskey from his American-flag-branded hip flash, proves himself to a jeering crowd by charging down the 90 meter ski jump (the big kahuna; the one that separates the men from the boys) plowing through a Marlboro while rock music serenades and turns his arctic assault to slow motion. Unusual flairs like this aren’t uncommon in the narrative and the relationship between Jackman’s coach-weary Peary and Egerton’s incessant trainee gives the film character and characters genuinely worth caring for. The mentorship favors more of a buddy-buddy relationship than a student-master one and their unlikely pairing compromises much of the film’s comedic angle. Take when Bo Derek becomes the carrot dangling at the end of the stick for Eddie’s coaching, with Peary training the non-drinking, very-likely-virginal Eddie in the fine art of an O-face. Chemistry between Egerton and Hughman is natural and builds nicely, aiding in our own inevitable investment in this bizarre series of events that sees an amateur ski jumper find himself sharing the hill with the most elite athletes in the world only to inevitably…well you’ll see. CONCLUSION: From a birds eye view, there’s not a ton of novelty to ‘Eddie the Eagle’’s underdog sports narrative but refreshing individual moments and outlandish characters make it an experience worth extending a cheer for, minor though it may be. 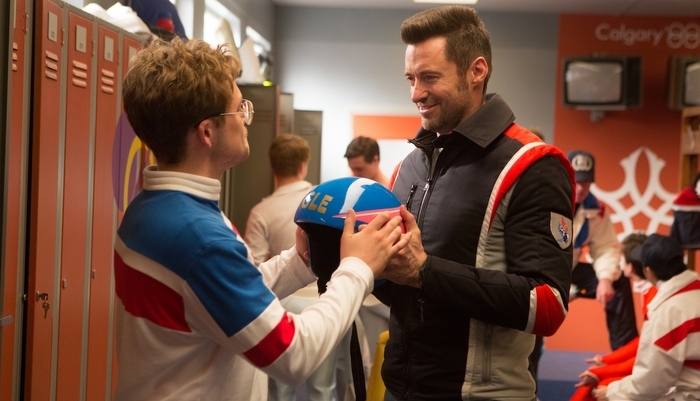 This entry was posted in Out in Theaters and tagged Christopher Walken, Dexter Fletcher, Eddie the Eagle, Hugh Jackman, Jim Broadbent, Jo Hartley, Keith Allen, Out in Theaters, Reviews, Taron Egerton. Bookmark the permalink.